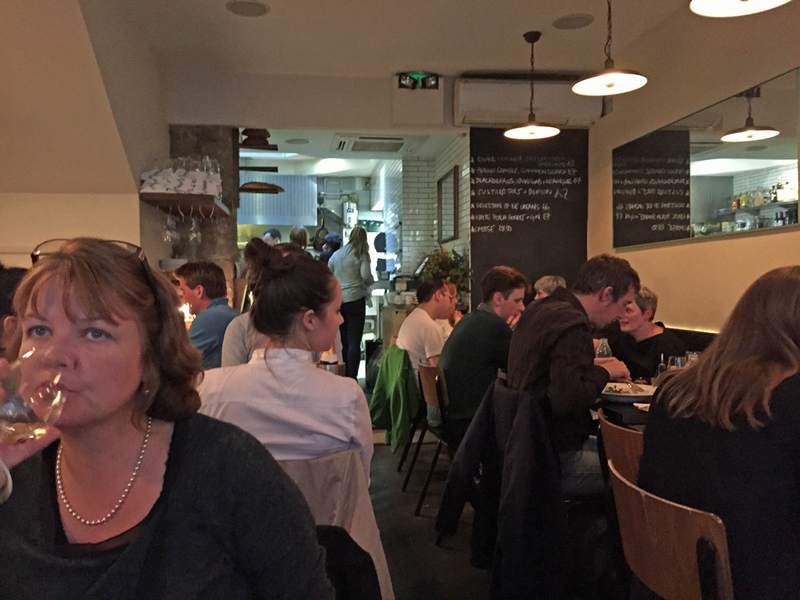 In another in the series of the random, unresearched, let’s just pop in sort of place (so far successful) we walked in to 10 Greek Street for a pre-Ronnie Scott’s supper. We’d already rejected eating afterwards for once, or at Ronnie’s, and the Lebanese place down the road didn’t appeal after all. We went in, sat down and studied the short menu, armed with some tap water in milk bottles (what else?) and some house white – a vert tasty french Vermentino at £17 a bottle. It was 17:55 and within ten minutes it was full with a long waiting list of people installed in nearby pubs ready to be called when their table came up. So, we must have picked somewhere good? Well, for a start it didn’t advertise itself. No neon lights or big lettering on the fascia, just a black shopfront and discreet lettering on the window. Around ten or eleven nicely chosen dishes – starters and mains if that distinction still applies – plus a large single scallop special (with white pudding and not shareable so rejected). We enjoyed a couple of fig, honey and Parma ham bruschetta to share, plus a selection of simple, very tasty and beautifully presented larger dishes to follow. All in all excellent, and around £110 for four without service. No wonder there was a queue. 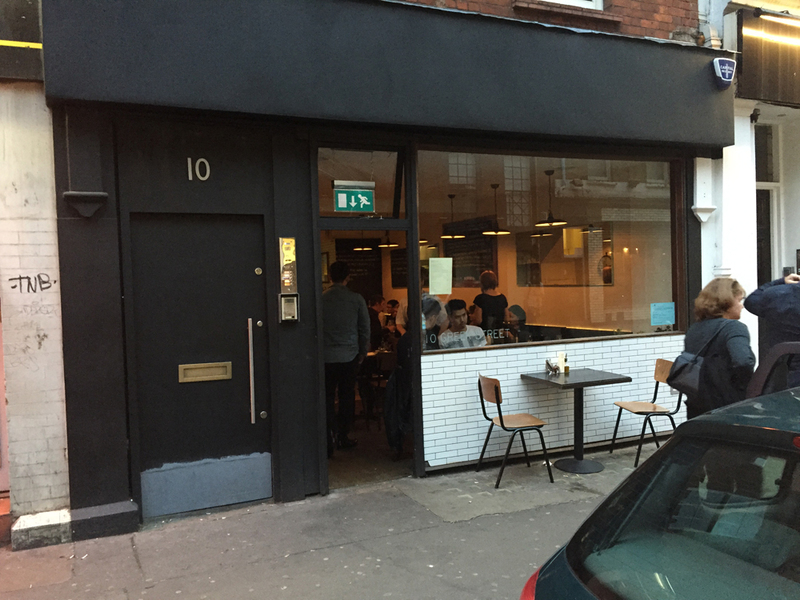 So, when we get back, we discover this little place was described as “a bit of a diamond” by Jay Rayner. So there, the seal of approval. Suited us just fine that it didn’t take reservations but it wouldn’t suit everyone. Still, we’ll be back. 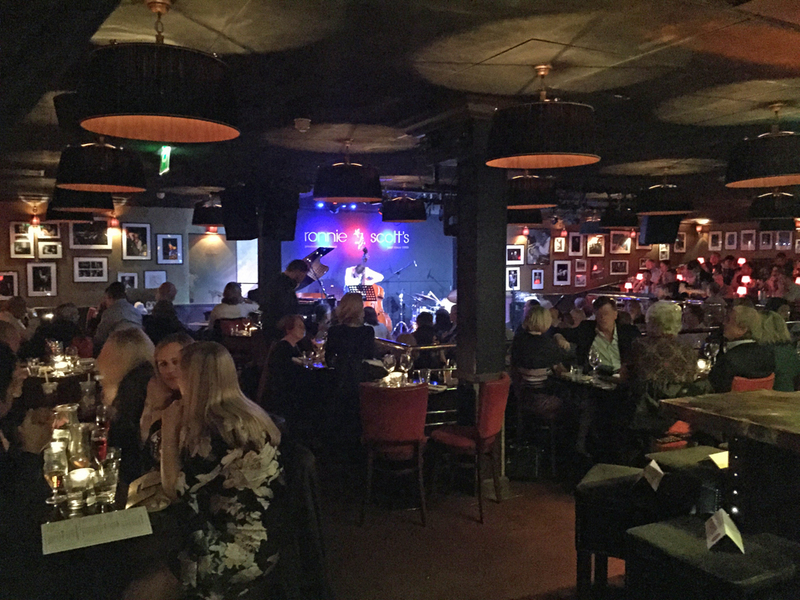 Incidentally, the main event – Ian Shaw Trio at Ronnie Scott’s – was sensational. His pianist – Jamie Safiruddin – who he claimed was eleven (we guessed twelve) was simply stunning. Ok, he was a proper grown up but to be able to play in such a confident, sensitive way, was quite unbelievable.